They say history repeats itself. Elections are always interesting and the debates are fun to watch. But, I will be glad once this is all decided. Although selfishly, I wish the political emails were less persistent. I get all three emails (I guess that’s what you get when you vote for a person not a party, you get everyone’s two cents). I’m appalled at the money spent on the campaigns. Money that could really help some of our citizenry who need it. Money that COULD fix those roads, John. 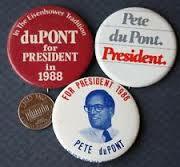 I remember Ross Perot and his campaign slogan “Ross is my Hoss”, but duPont slipped by me back in the day. Thanks for the history lesson. John — this is such an interesting post. 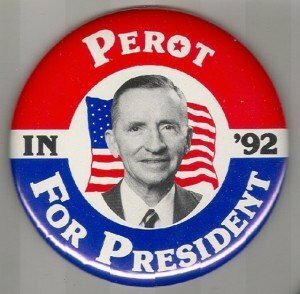 Each politician usually has one idea that seems good or workable. Maybe that is enough for a platform but then they drift when it comes to creating a big picture. It gets too big. I agree with you about government being too big for one person. Thanks for writing about politics… maybe you should do it more ….. Politics is a touchy subject, but you presented it with great perspective. I find it impossible to understand what is happening now without knowing what happened “then.” Thanks for the history tidbits!